Turkish President Recep Tayyip Erdogan has filed a criminal complaint against main opposition Republican People’s Party (CHP) leader Kemal Kilicdaroglu for “insulting the presidential office” in remarks on an alleged phone conversation between Erdoğan and his son, the state-run Anadolu news agency reported. Hüseyin Aydın, a lawyer representing the Turkish president, reportedly filed the complaint against the opposition leader on Jan. 8 on the grounds that the CHP leader had used similar arguments “adopted by the Fetullahist Terrorist Organization (FETÖ)” during a speech he delivered in front of the Besiktas municipal building on Jan. 5, 2018. 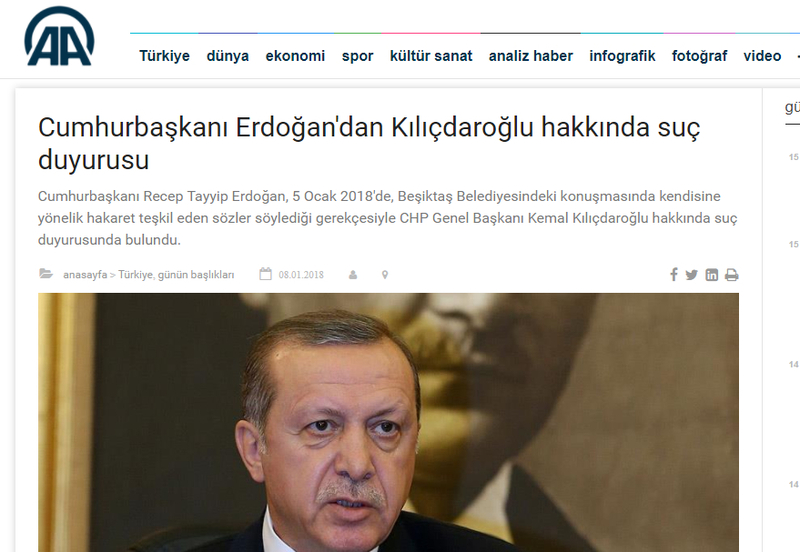 Kılıçdaroğlu is accused of violating the 299th article of the Turkish Penal Code (TCK). “FETÖ” is an abbreviation for the Fethullahist Terrorist Organization, coined by the Turkish government to define Turkey’s Gülen group as a terrorist organization. The government accuses the group of masterminding a July 15 coup attempt in Turkey.